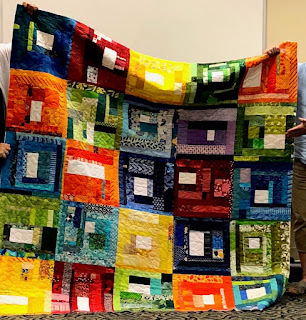 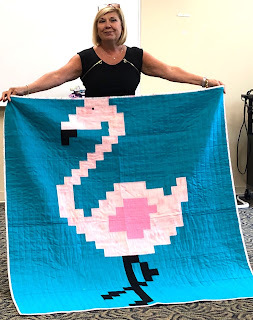 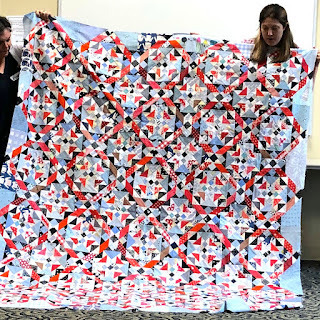 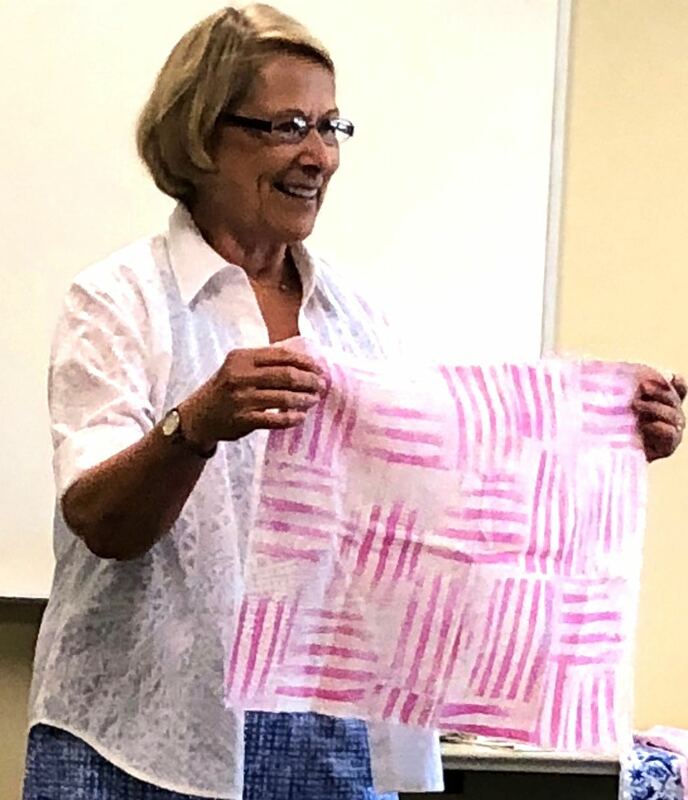 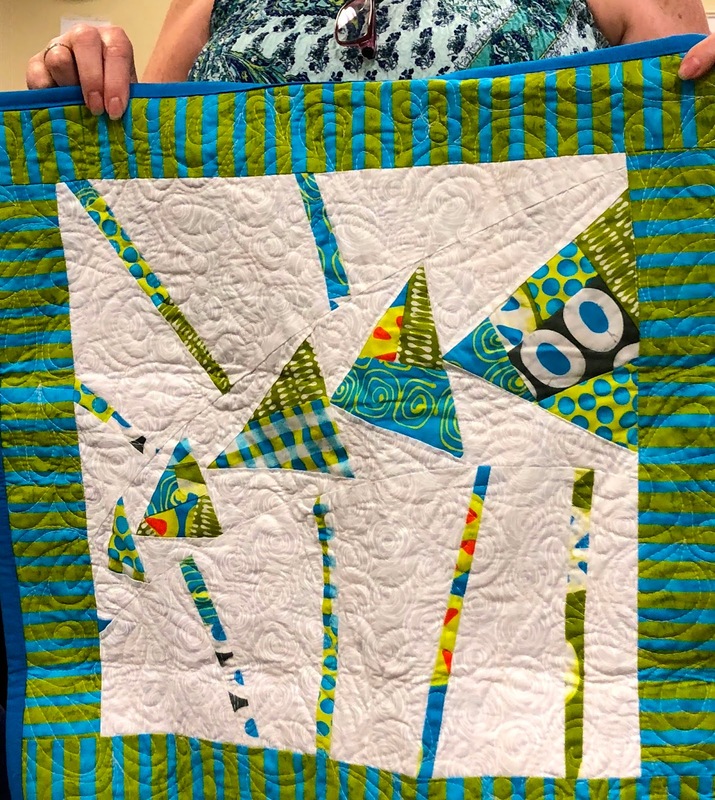 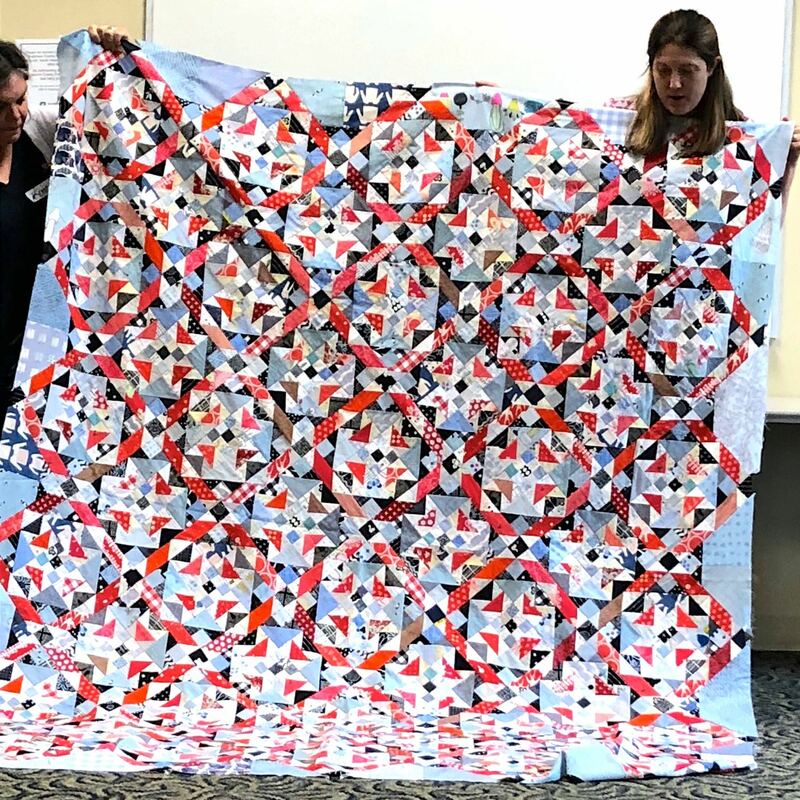 Notes from the Baltimore Modern Quilt Guild’s general meeting on August 12th, 2018 at the Arbutus Public Library. Meeting led by President, Rose Daley. 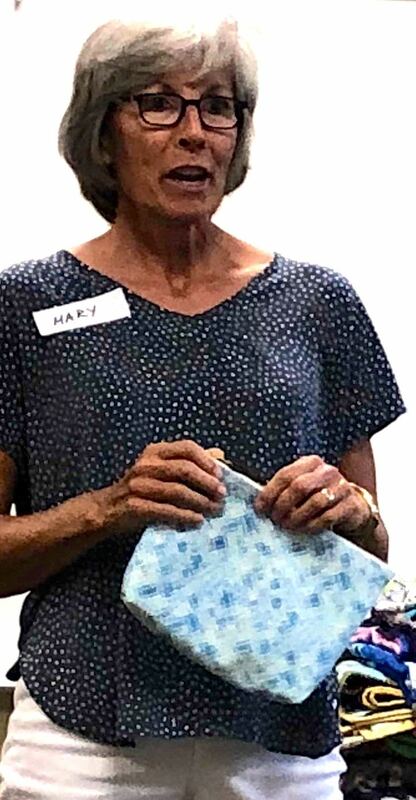 Two guests attended (were referred to us by the staff at Glory Bee Sewing Center in Fallston, MD. 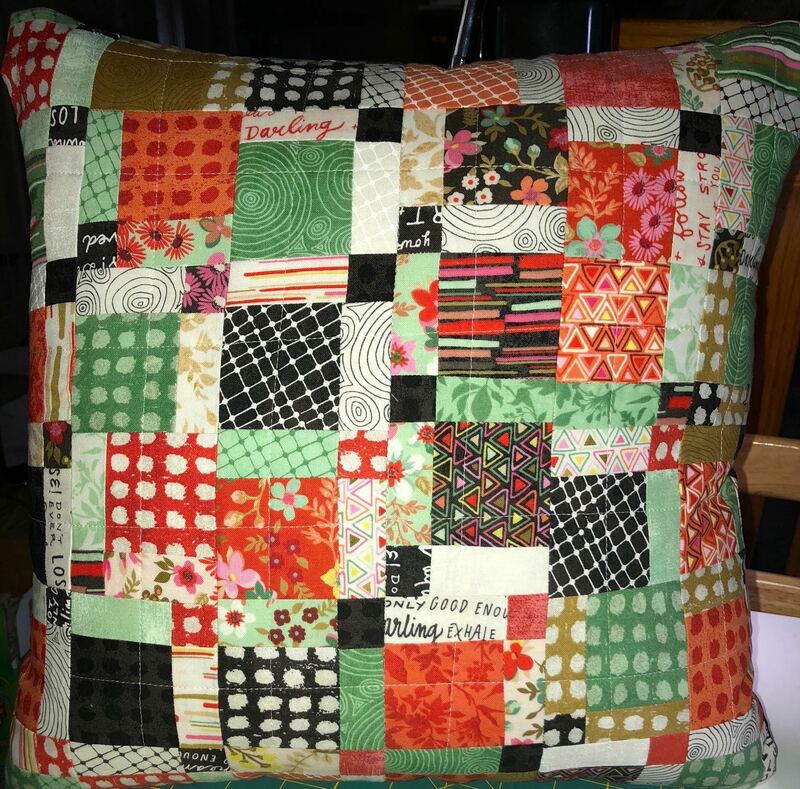 There were two members who had birthdays in August and each chose a fat quarter from the birthday prize bag. 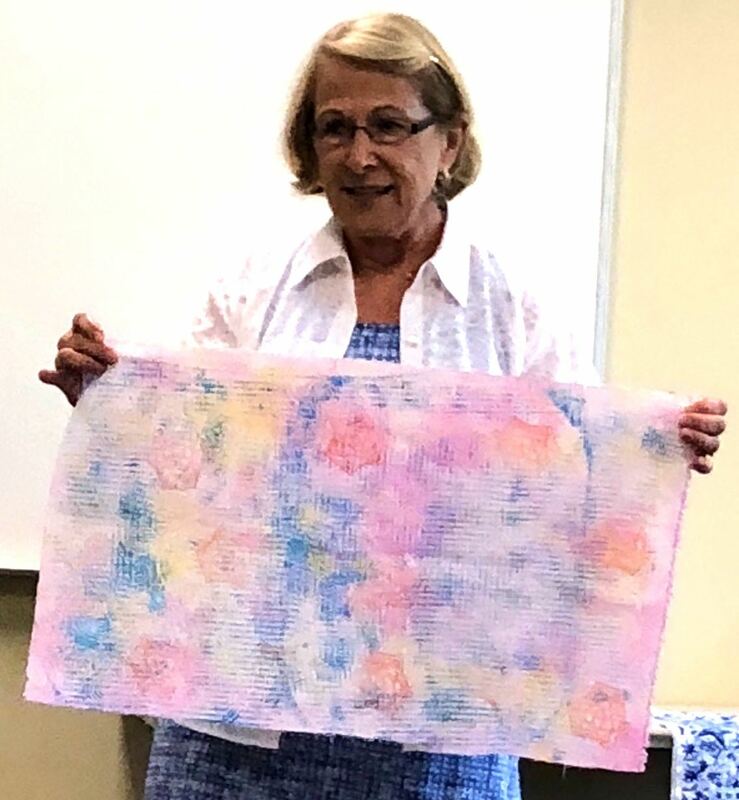 Rose introduced the board members present. 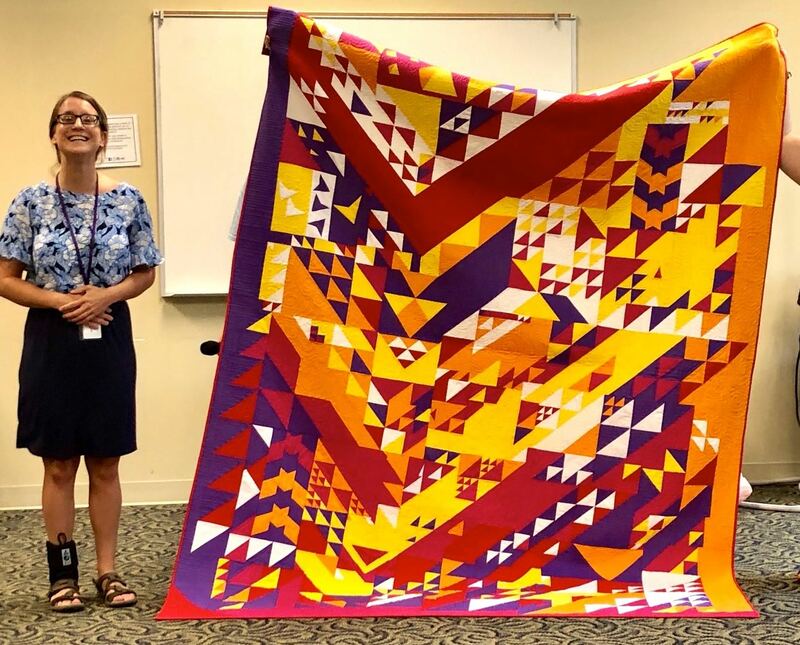 We presented our 2017 charity quilt (Birds in Air) to a representative from House of Ruth in Baltimore. They will be using our donation on a bed in the house itself. 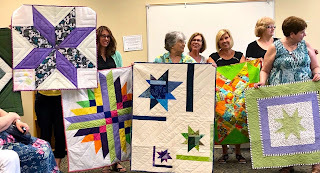 Star Challenge quilts were collected to be donated to the East Baltimore Early Head Start program. 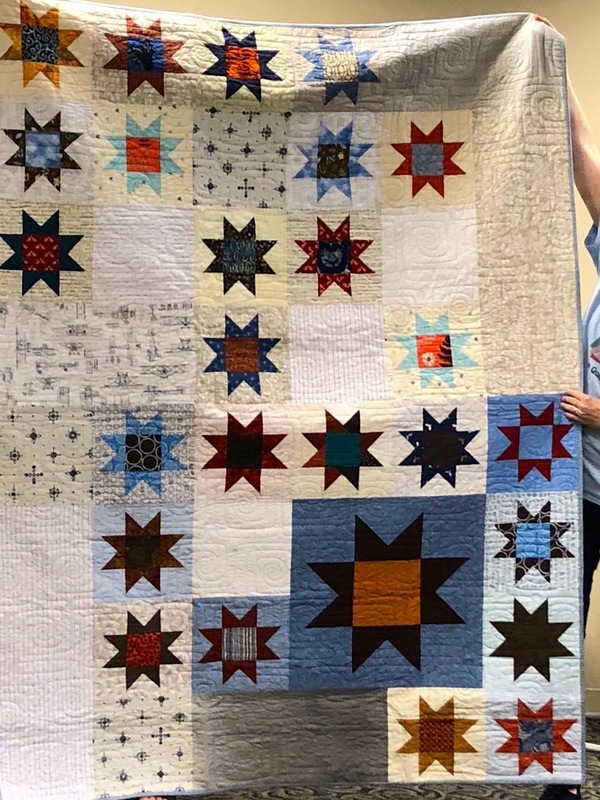 Quilts will be taken next month, too. There are currently 80 kids in the pre-3 program - these are infants/toddlers up to 3yrs. of age. Our quilts are given to their families to make a cosy corner for the kids to read at home. 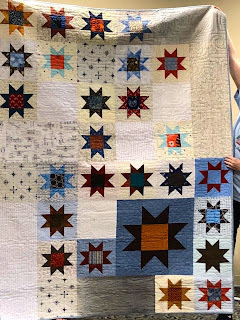 At the age of 3, they go on to Head Start and most of them take our donated quilts along to use for nap time. The Michael Miller company challenge fabrics have been received and were distributed to the members attending who signed up. Drawing special interest baskets: We are collecting 'stuff' to fill the four special drawing baskets we've chosen. 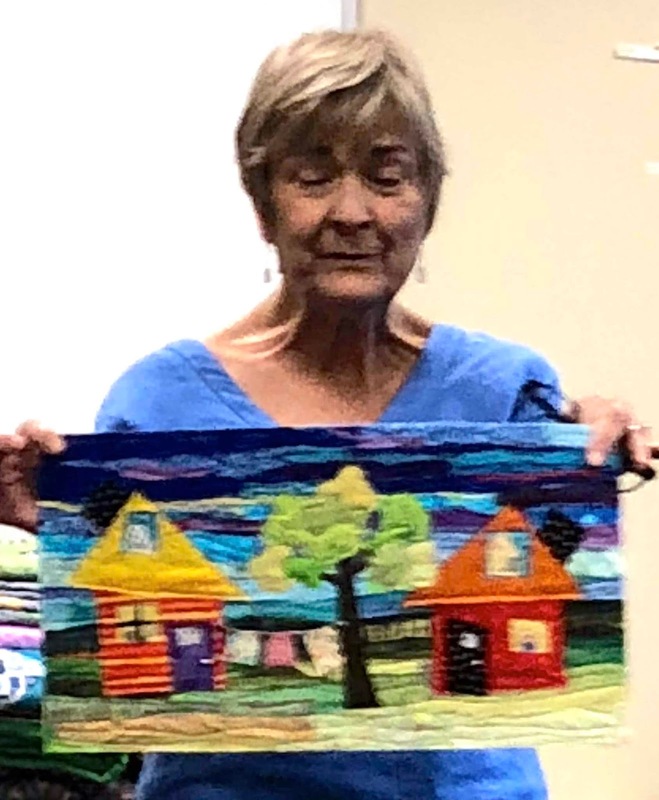 The themes are Tea/Coffee (Ann Hussein is in charge), Sewing (Diana Bear), Gardening (Valerie McNeese) and In the Kitchen (Sarah Kachler). Tickets to attend the bingo are now available to purchase. 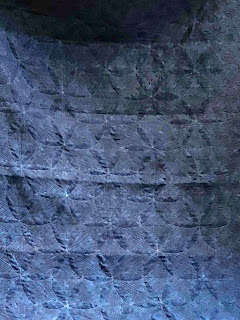 $10 per seat now, $12 at the door. 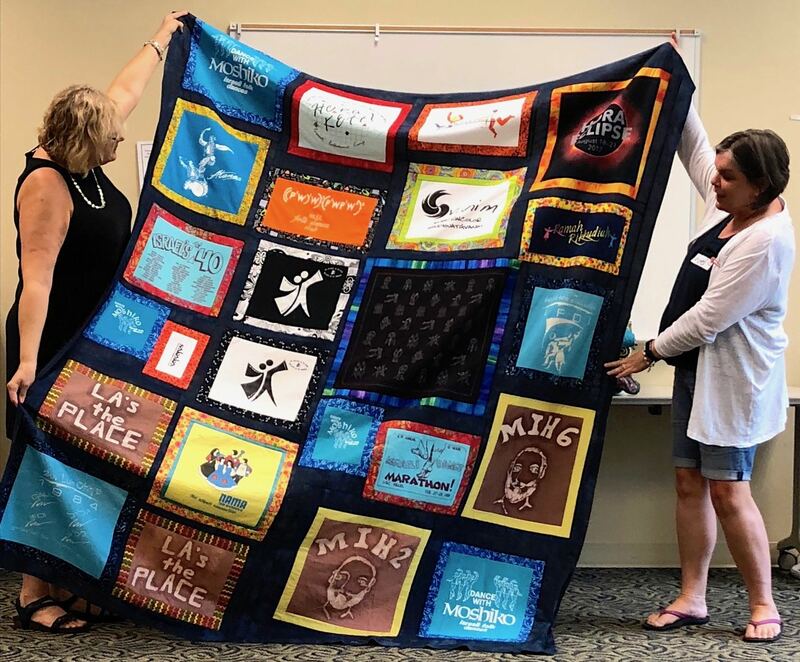 Please contact a board member for more info. 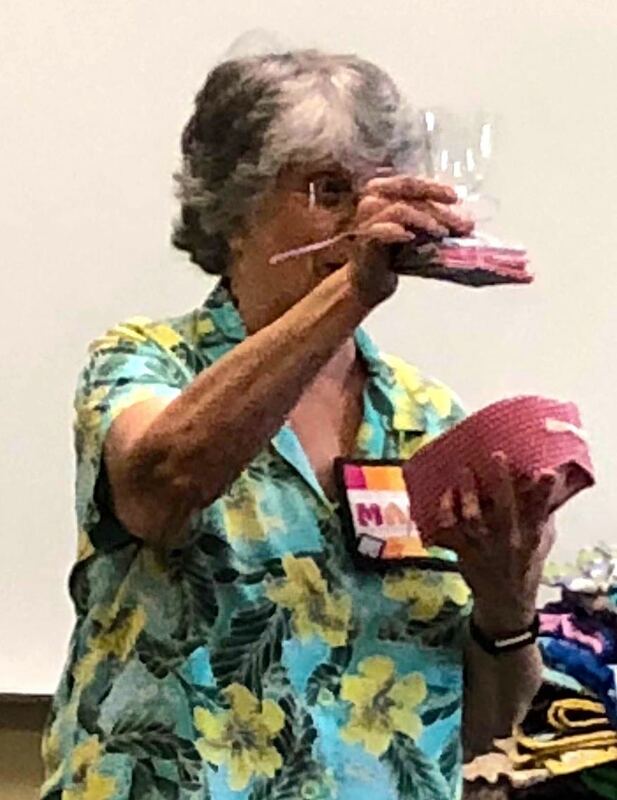 Volunteers: We need members to volunteer to help out on the day of bingo. Please follow this link to see what jobs need doing and to sign up. 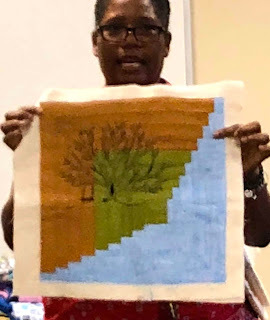 Our next chapter sewing retreat will be held at the Pearlstone Center in Reisterstown, MD from November 15 - 18. 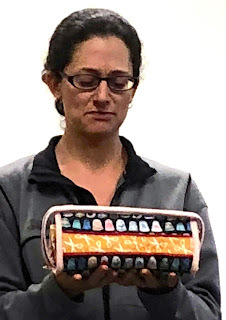 Please follow this link to register (there are only a couple of rooms remaining). Marcia Schwartz from the education committee announced that our next 'outside teacher' workshop will feature Melanie Tuazon and will be held on Saturday, October 13th at Springwater Designs Quilt Shop in Columbia, MD. 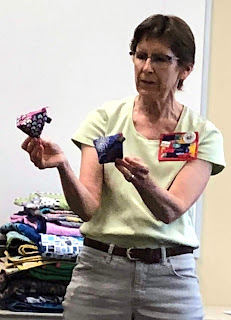 Details for the workshop will go out via email shortly. Sign up will open next Saturday. 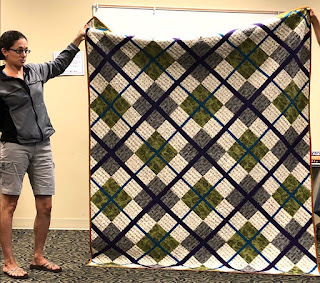 The class, Using Curves in Modern Quilts, will cost $60. 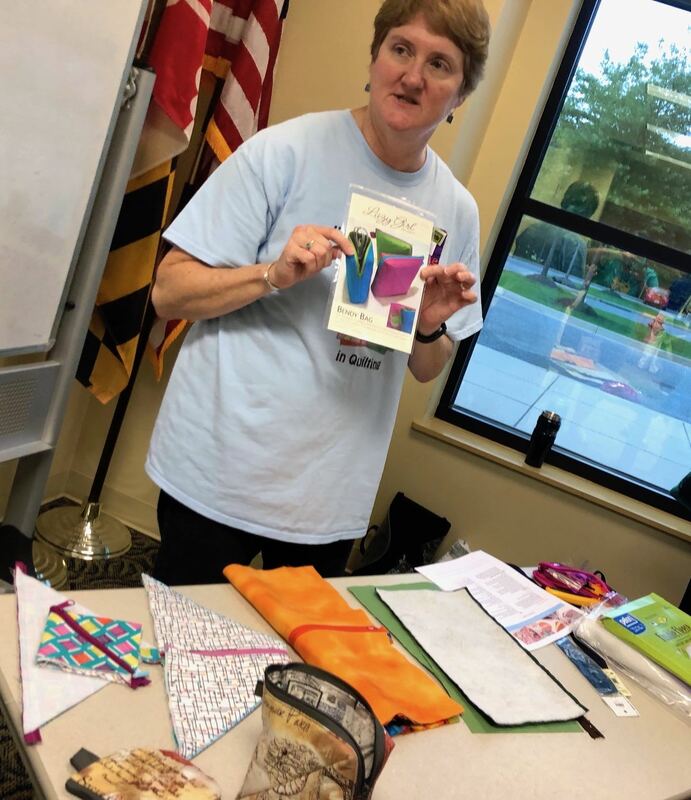 Marcia will host a potluck dinner at her house in Catonsville on Saturday evening to which the entire membership is invited. 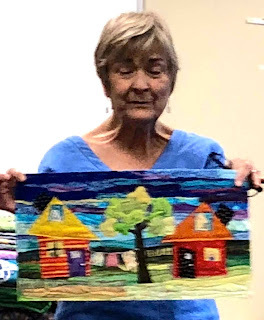 Melanie will also be speaking at the general meeting on Sunday, Oct. 14th. 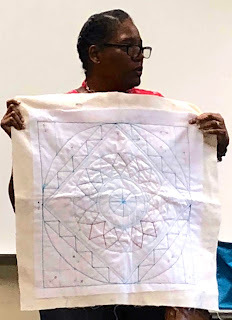 Our 2019 workshops will include one with Jackie Gehring in March (topic to be determined) and with Shawn Kimber on Small Piecing in June. 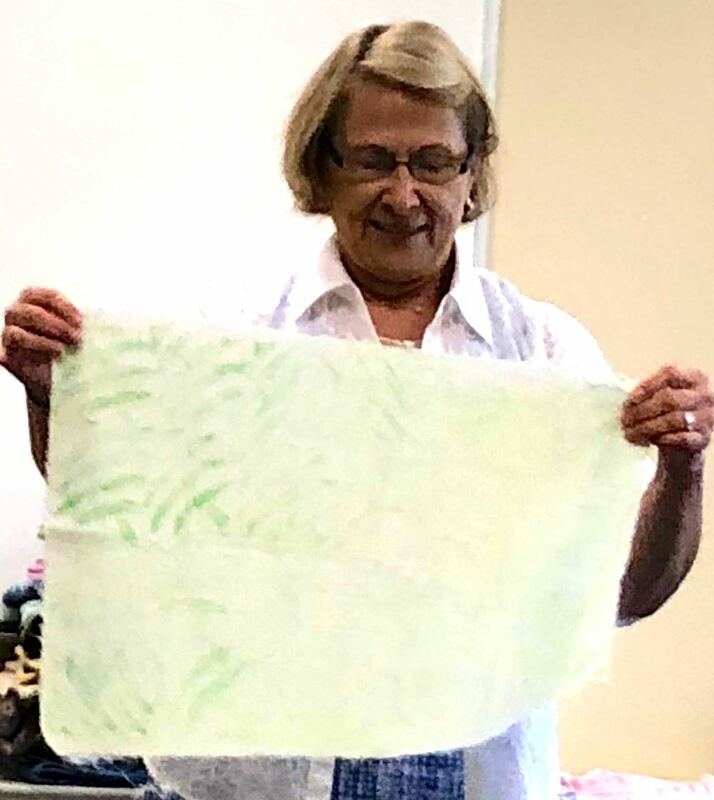 A third workshop is still being planned. 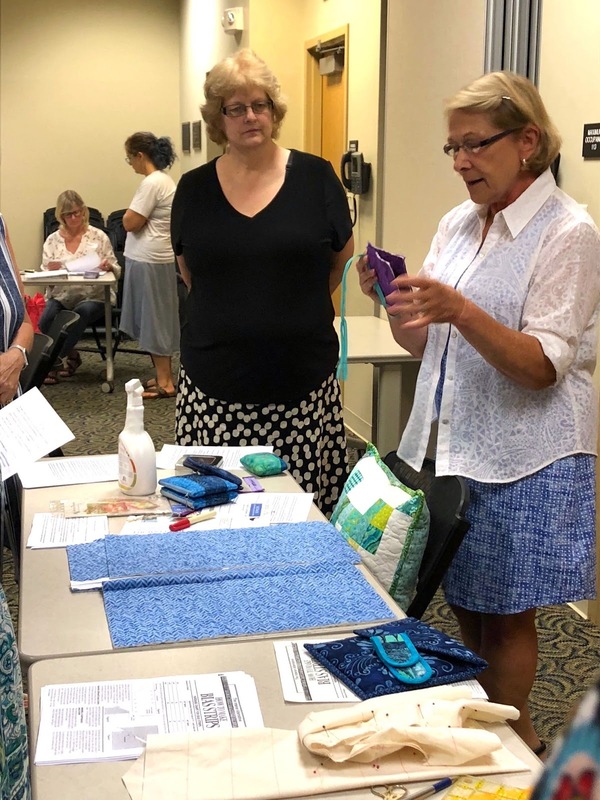 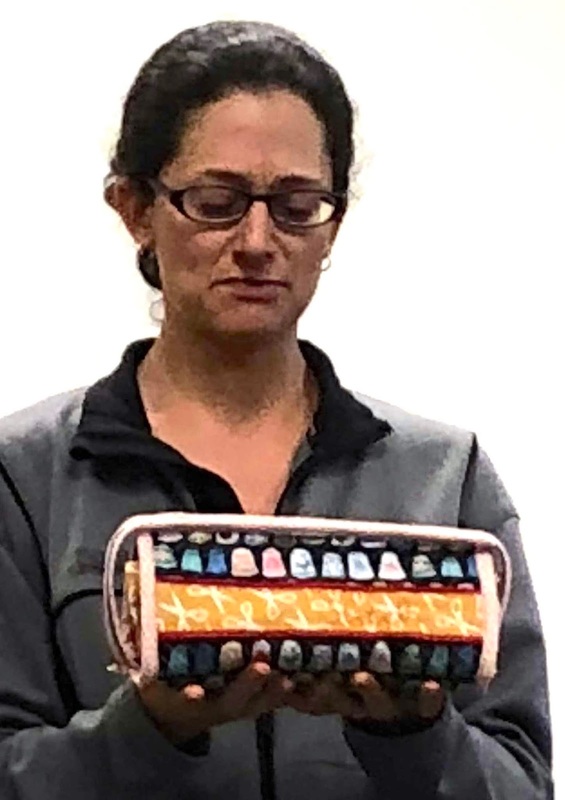 Today's meeting features three demonstrations, given by Rose Daley, Bobbi Pippin and Daniella Syed, on making zipper pouches. 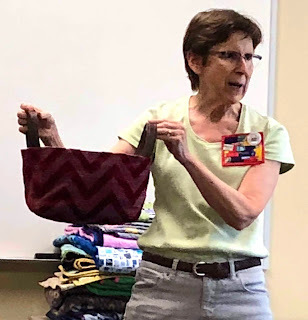 Rose showed the Bendy Bag and the Sweetpea Pod by Lazy Girl Designs. Bobbi shared how to insert a zipper in a pillow, with and without a flange. 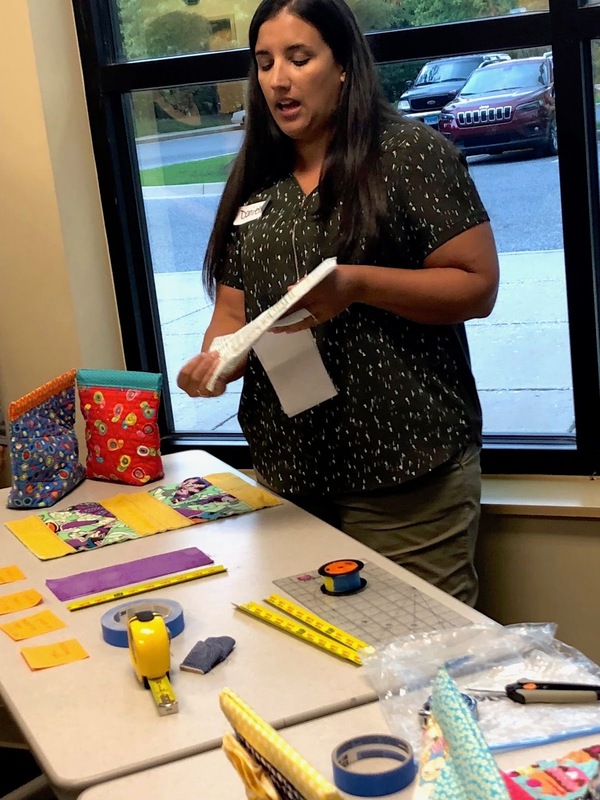 Daniella showed how to make snap pouches. 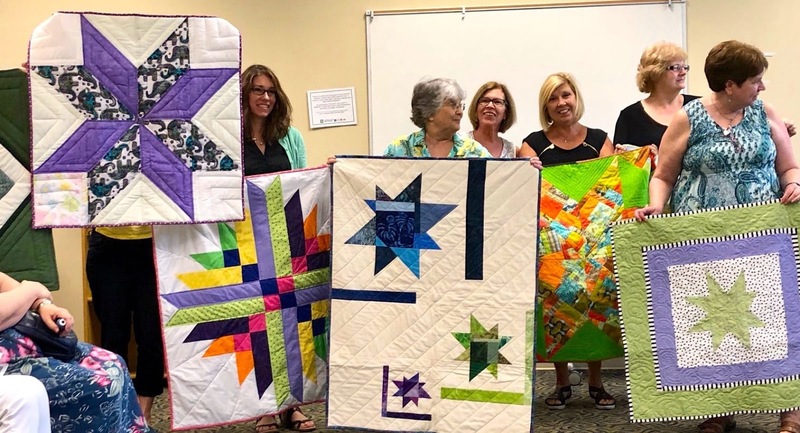 Dues to the national organization are scheduled to increase by 20% for this coming year (about $15 - 18 per member). In September, Rose will present a proposal to increase our chapter dues as well as explaining what exactly our membership dues cover. We currently have 96 members. 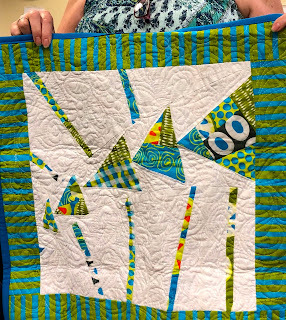 The dues level must be voted on at the September meeting according to our By-Laws. 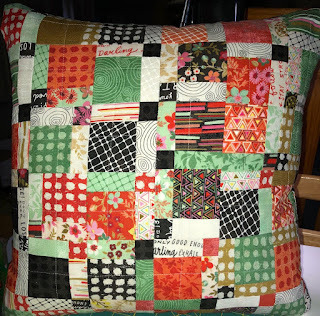 I (Linda Schiffer) shared two pillows I made for bingo prizes. 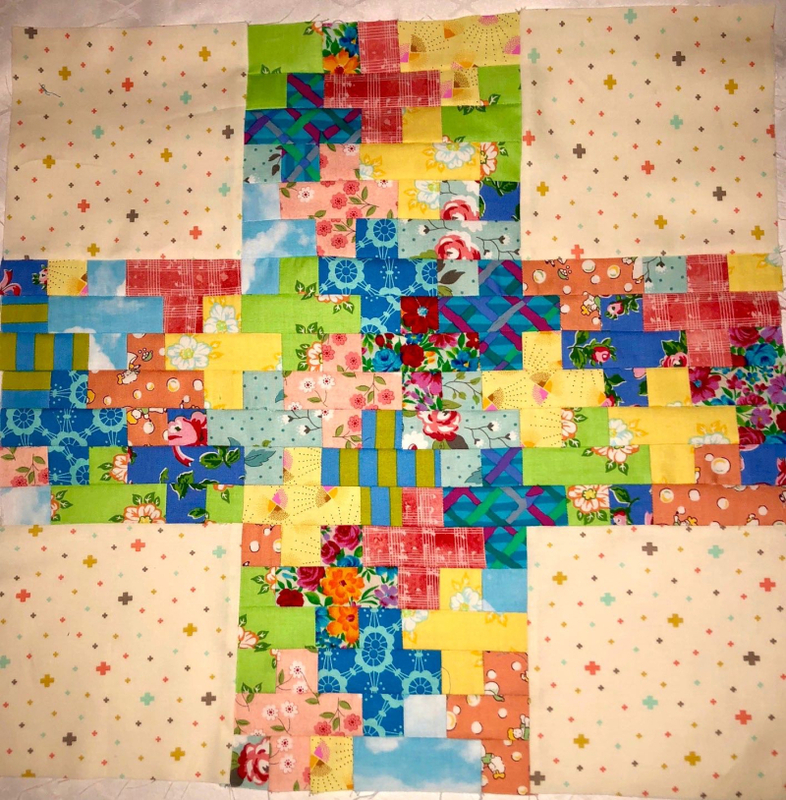 Also a 'plus' design mini quilt top made for a swap on Instagram. 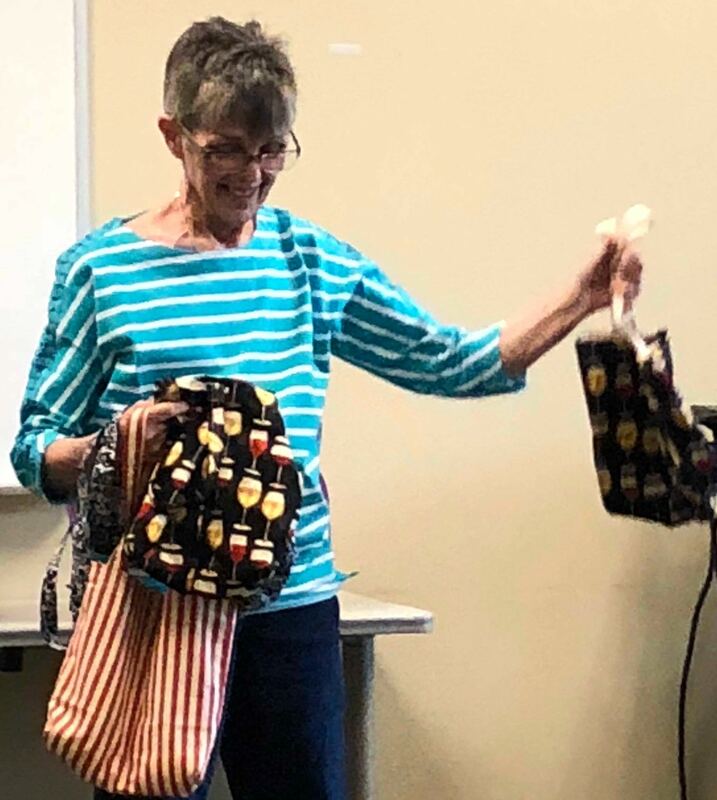 Phyllis Cook brought bingo prizes made by Lauren Stevens. 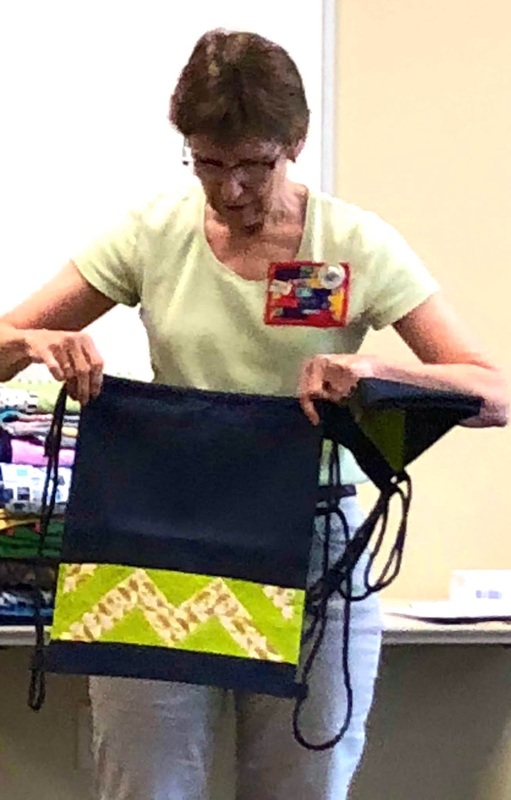 Phyllis also made two patchwork backpacks to donate for bingo prizes. 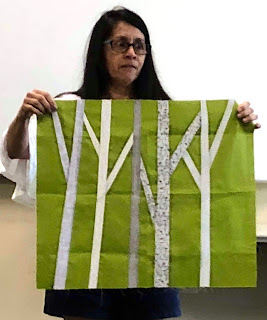 Diana Bear (new quilter and new member) shared a slash-and-insert Birch Tree project. 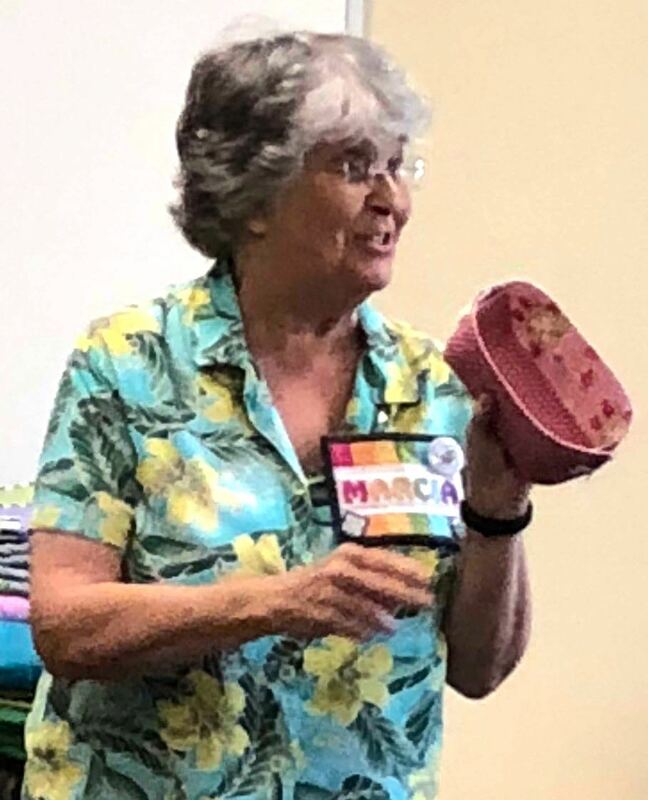 Marcia Schwartz shared two bingo prizes - wineglass coasters and a button basket. 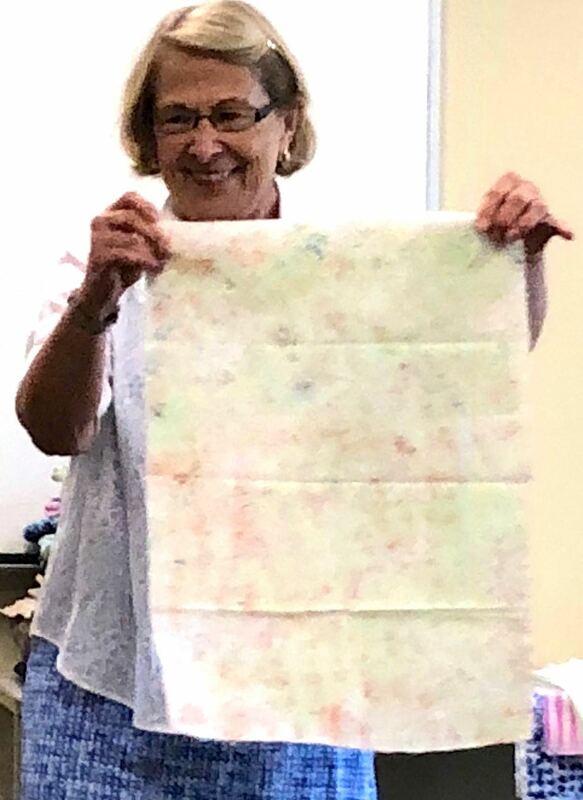 Bobbi Pippin shared fabrics that she hand painted at the recent MAQ Seminar. 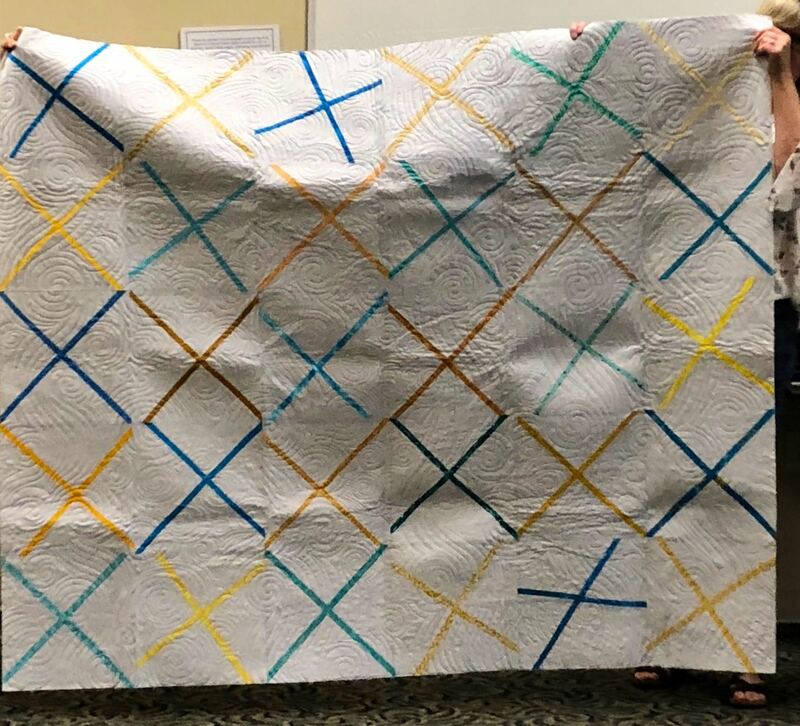 Kate Lane shared a quilt she made years ago and is in the process of re-binding (correctly:). 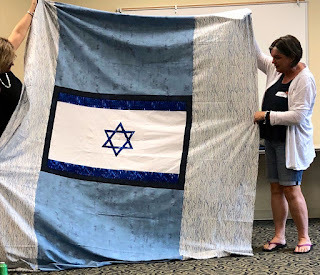 She also showed a T-Shirt quilt she was commissioned to make for an Israeli dance master. 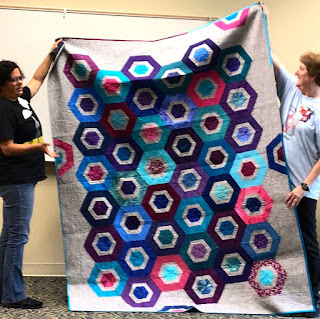 Sarah Kachler shared her On Ringo Lake top, made from a mystery series by Bonnie Hunter. 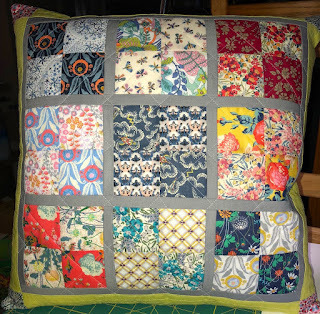 Michael Miller challenge fabrics. 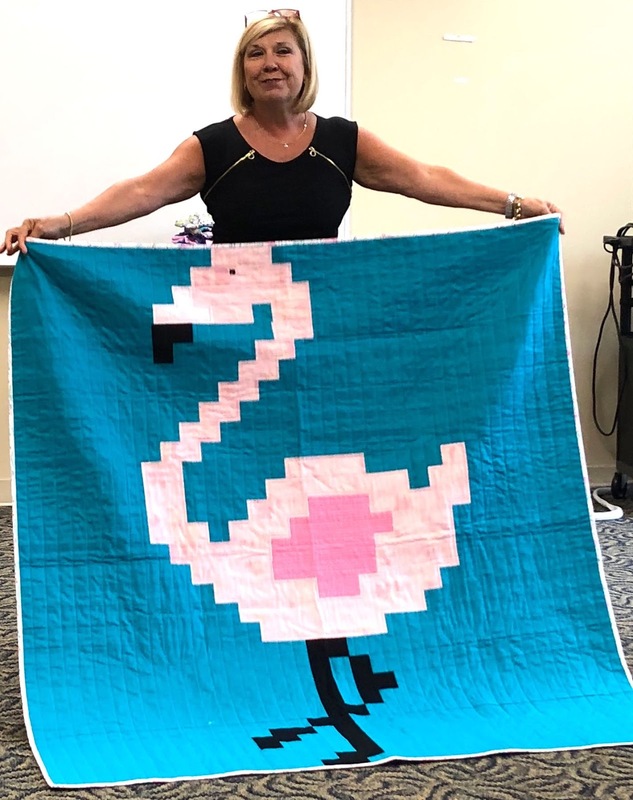 Also a flamingo themed baby quilt. 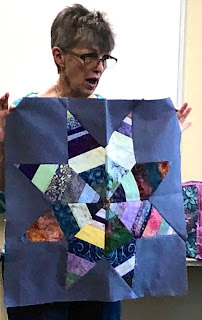 Pat Simrell showed her string pieced 8 pointed star from the recent workshop. She also made an assortment of lined drawstring bags for bingo prizes. 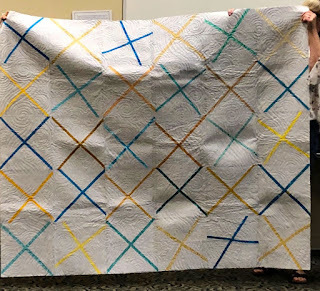 Becca Ruch shared a quilt she free motion finished on her quilting frame. 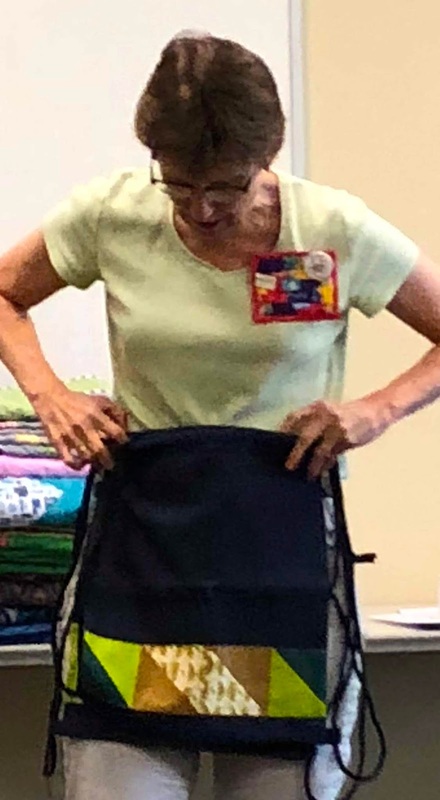 Mary Concannon made a zipper pouch for bingo. Stephanie Strunge made a raw-edge applique piece (from a class at MAQ?). 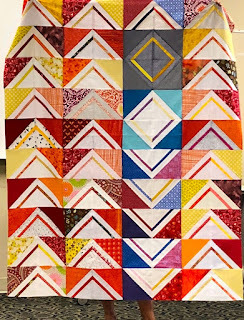 Laura Rieben donated a small wall hanging for bingo. one on free motion linear embroidery and the other on machine quilting whole cloth. 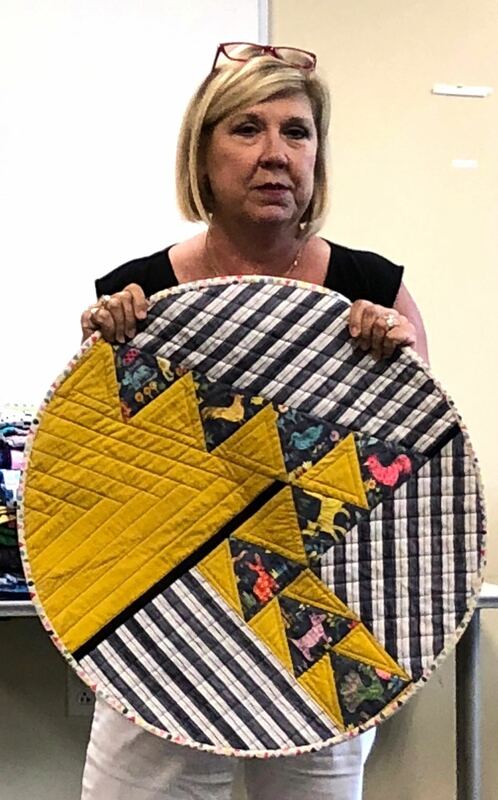 Jenn Paulson showed a quilt she made for her second son's 'big boy bed' and a Sew Together Bag she finished. 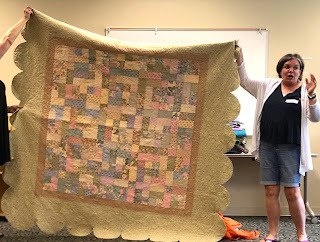 Minutes and photos taken and posted by Linda Schiffer.